Canyon frogs mate in Little LO Canyon. It was just over a year ago on Memorial Day weekend. Tanner, Ron and I were donning wetsuits and harnesses at the start of the technical section of Little LO Canyon when we stumbled upon these two canyon tree frogs mating. Undoubtedly shortly thereafter hundreds of eggs were laid in the pools of Little LO. Two weeks later tadpoles probably hatched and sometime in August they metamorphosed into the next generation of canyon tree frogs. Ten months later a small number of these frogs are very likely alive and could be breeding right now in the intact and pristine habitat of Little LO. Between five and 15 miles away in similar canyons comprised of the same geology and vegetation the canyon tree frogs may not be as lucky. Canyon tree frogs mate in Little LO Canyon. Tanner in the narrows of Little LO Canyon. Golden Columbine in Little LO Canyon. Tanner (left) and Ron take in Little LO Canyon. Ron and Tanner work their way down Little LO. 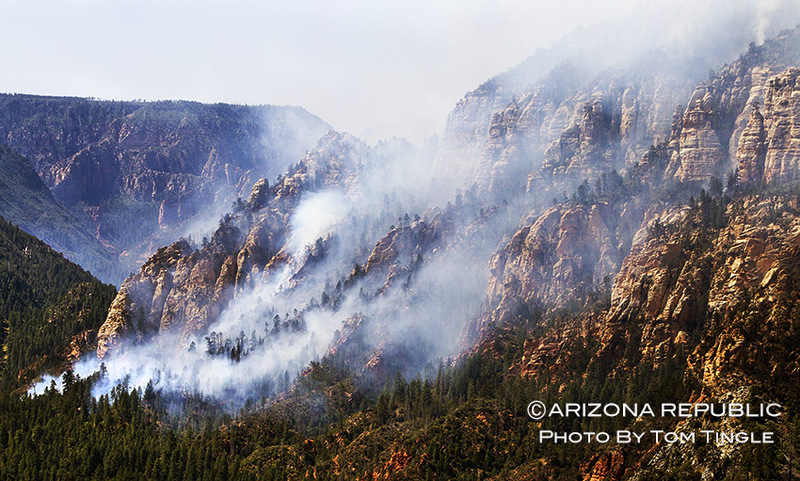 The Slide Fire began on May 20, 2014, near Slide Rock State Park north of Sedona. 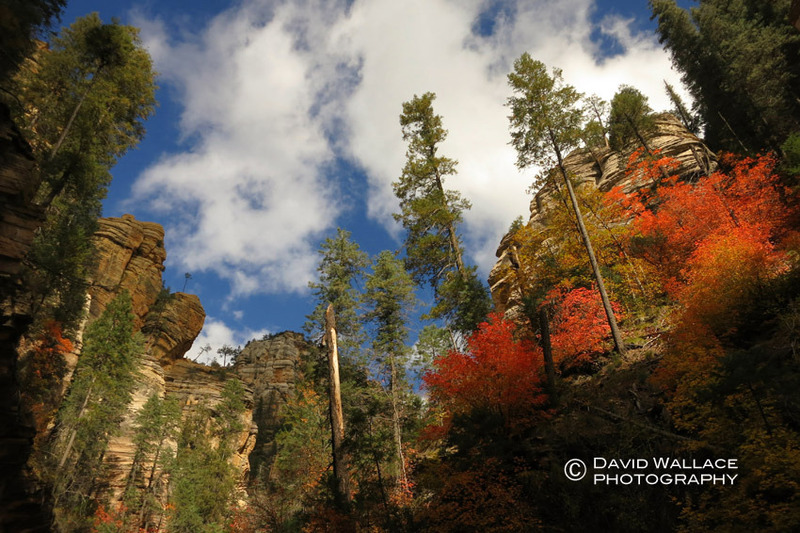 Southernly winds quickly moved it up into Oak Creek Canyon and then hikers, photographers, adventurers and outdoor lovers watched in horror as it moved into one of the gems of Arizona, the West Fork of Oak Creek. At the time of this post on June 1, 2014, the fire has burned over 21,000 acres and is 90% contained. Residents in Oak Creek Canyon that were forced to evacuate have been let back in their homes, so it appears the fire is very much under control. Firefighters have moved into the mop up phase. Unlike the unimaginable tragedy of last year’s Yarnell Hill Fire that killed 19 firefighters and destroyed over 100 homes and structures, this fire has caused no major injuries or burned any structures. I do not wish to take away from the primary importance of the lack of human suffering in this event or from the hard work and bravery of our wildland fire firefighters that worked the Slide Fire, but I must say my heart aches to think that such a unique and pristine American habitat has undoubtedly been greatly affected, possibly for a very long time to come. Of course until boots are on the ground it is hard to say the extent of the damage to this habitat. I have heard some reports from firefighters who worked the Slide Fire that said much of the pristine quality of the W. Fork is still intact. They say in many areas the fire was kept at a low intensity preventing it from getting into the canopy of the trees. This is known as a crown fire and essentially obliterates the forest that it burns. If the fire did not crown then it is actually healthy for the habitat in the long run. Needless to say when you look at the map of the Slide Fire on the InciWeb site it doesn’t look promising. I think if you asked most Arizona canyoneers what area they would most not want to burn related to their favorite canyons, this is a worst case scenario. Illusions, Insomnia, Immaculate, Barney Spring, Flintstone, Casner Cabin, Crack Addict in addition to the West Fork and Sterling Canyons that they feed into, are all completely within the boundaries of the Slide Fire. I first experienced the West Fork shortly after moving to Arizona in 2006 and was amazed by its seductive quality. Since then I have been back over a dozen times, often on the hike out after completing a technical descent of one of the side canyons. There is no better way to finish out a day than a tranquil stroll through those soaring red and beige canyon walls as your feet slosh through crystal clear water. I have been in the West Fork during all four seasons. I have been there on assignment for work. I have been there with my parents, my sister, my dog, of course Laura. I have been there with my friends’ baby who at the time was six-months-old. Sadly, my son Wyatt, 3, who although has seen many other special places in Arizona’s backcountry has not experienced the West Fork himself. It could be years before the West Fork is reopened to the public for Wyatt to see for himself and when it does who knows what he will see of this place that I along with many others hold a special connection to. Ultimately fire is part of nature; a raw, rugged and destructive aspect of it, but nature nonetheless. Although I can’t help but wonder how natural is it when fires are started often by man as was the case with the Slide Fire and burn with a greater intensity because of a number of reasons associated with human impact. When will the area reopen and what will we see when we get there. Only time will tell but nature will continue one way or the other. Back in Little LO Canyon a year ago, Ron, Tanner and I had a wonderfully pleasant and uneventful descent. I imagine our canyon tree frog friends having such a good time when we ran into them or at least their kin are doing fine in their perfectly suitable habitat; how quickly that can all change. Below you will see some of my favorite photos of the W. Fork of Oak Creek Canyon system and the nearby Crack Addict Canyon/ Sterling Canyon. We will just have to wait to see what we see when we get back in there. 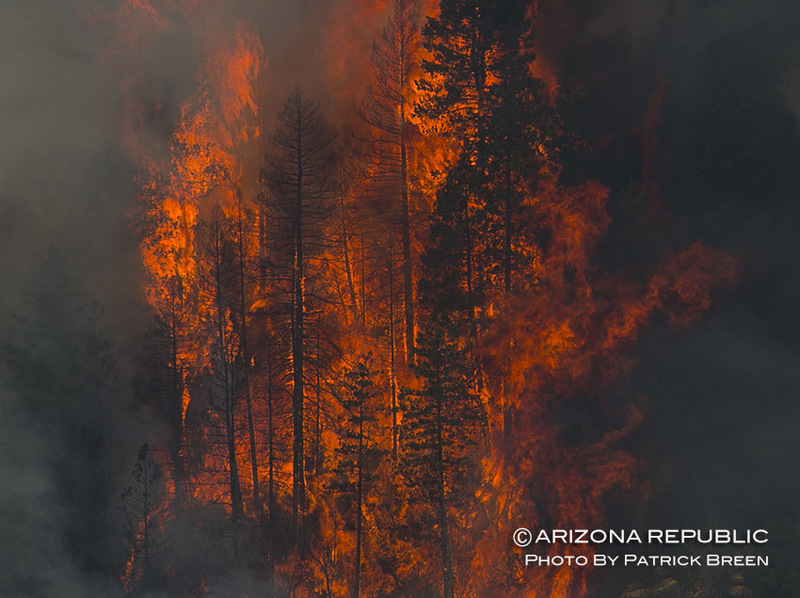 Also check out a slideshow of the Arizona Republic photographers coverage of the Slide Fire by clicking here. Upper W. Fork of Oak Creek near Casner Cabin Draw. Natural arch in Illusions Canyon. Helping my mom during one of the many stream crossings in the W. Fork of Oak Creek Canyon. The big drop in Insomnia Canyon.